Water is the essential ingredient to creating a beautiful, thriving garden. When a garden is new – the first 6 weeks after planting – the objective is to keep the soil slightly moist to encourage the roots to spread and grow out of the root ball. Once the garden is established, the goal is to encourage the roots to grow deeply. This is accomplished by alternating deep waterings with drying out periods. It is the responsibility of our clients to make sure their plants are watered. We have created six reference guides with detailed watering instructions to help you properly water your garden throughout the season. Choose the guide based on the type of watering system you intend to use and the watering restrictions in your community. 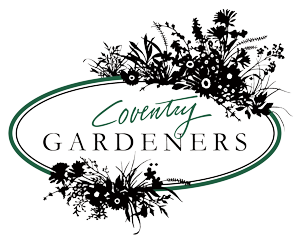 Karen and Jacinto set the example at Coventry Gardeners for taking pride in your workmanship. Good enough is not good enough. They go the extra mile that shows the caring they have for each client and each garden. When I was hosting the rehearsal dinner for my son’s wedding in our backyard, Jacinto came back several times to walk through the garden to made sure it was ready for this important day. Site designed by Marketing Queen Consulting.